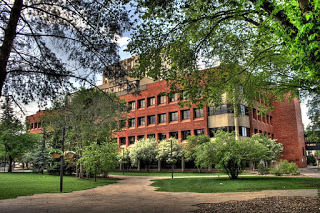 Faculty of agricultural, life, and environmental sciences was founded in 1915, tracing back to one of the oldest Faculties and earliest Departments at the University of Alberta. Teaching, research and community engagement within the Faculty are focused on healthy human environments; the sustainability of land, forests and water; the biological, economic, social and technological underpinnings of the bio-products industry; and global food systems. Agricultural, Food and Nutritional Science (AFNS) at the University of Alberta is a unique department, the first of its kind in North America, reflecting the integration of many disciplines to meet growing demands for safe and nutritious foods; bioproducts; and healthy human environments. Human Ecology is an interdisciplinary applied field that uses a holistic systems approach to examine the many contexts of people’s lives. Renewable Resources offers excellence in the discovery, dissemination, and application of knowledge about natural and managed ecosystems. Resource Economics and Environmental Sociology faculty and students pursue excellence in socio-economic research and teaching. The Alberta School of Forest Science & Management is the integration of ecological, economic and social forestry research and education. The Devonian Botanic Garden is a stunning 190 acre property made up of manicured gardens, mixed woodland vegetation and an extensive nature trail system. Highlights include the beautiful Kurimoto Japanese Garden, butterfly and cactus showhouses, ornamental flower gardens, alpine gardens, herb, sensory and healing gardens and more. Research and education are key activities for us in promoting and sharing the discovery and knowledge of plants. 0 Response to "Faculty of agricultural, life, and environmental sciences-University of Alberta"